Millions of people all over the world are apping for great cooking tips. People love watching TV-shows aiming to emulate details of chefs such as Jamie Oliver, Wolfgang Puck, Mario Batali, Rachael Ray, Nigella Lawson, Gordon Ramsay, Sandra Lee, Jacques Pepin, Bobby Flay and Giada De Laurentiis. Very often, however, the next day you go to the store and fill your shopping cart with ready-made food. 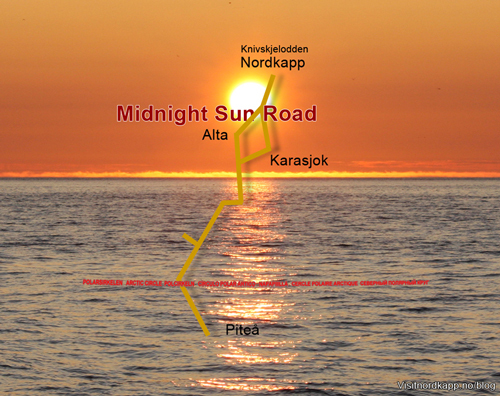 On our Midnight Sun Tour in 2012 Angelo and I ate local Arctic cuisine every odd day. Sautéed reindeer is one of my favorite dishes, along with Lutefisk and the Finnish hamburger at McDonald’s. 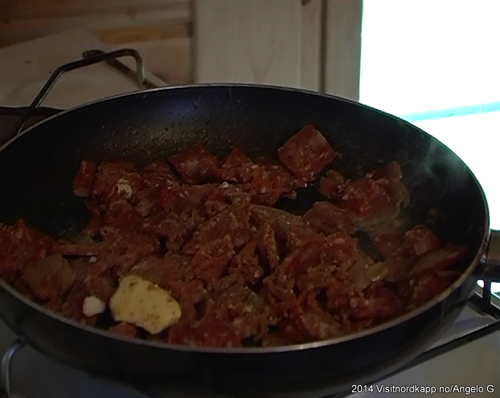 Sautéed reindeer, or “Renskav” is a dish on the menu on most restaurants in the Arctic. On our tour I had Sautéed reindeer several places. However, being a renskav connoisseur, I was displeased on many occasions. The only one that stood the test of my renskav tongue was the deal I got in Alta. 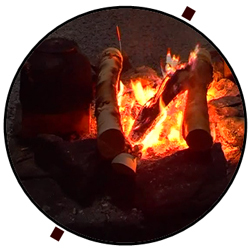 I remember a late arrival at Boazo Sámi Siida and a delicious renskav dinner. Back in Alta on our Diamonds of the Arctic Tour, we decided to go there again. Get the best renskav, and hopefully get the cooking secrets of the chef on digital reels. Ms. Berit Anne Eira gracefully introduced us to Saami cooking. There are no secrets, she said, it is very easy to make renskav. She sliced the meat into cubed thin strips and browned and sautéed it in a frying pan with margarine for a few minutes. Then she served the meat with mashed potatoes and assorted vegetables. Add a spoon of cranberries along with it, and sprinkle a little green parsley on top of everything. My kind of food! Add cream to the meat at the last sizzling sautéing stage. 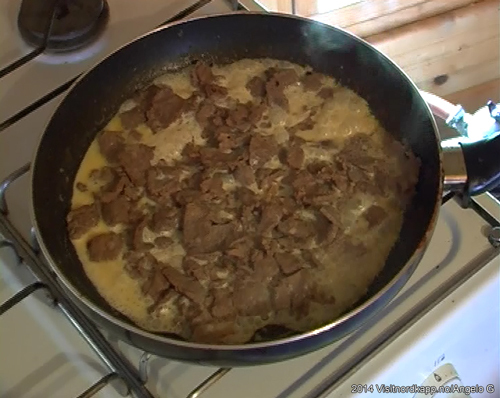 Renskav is the everyday national dish of the Saami people. A dense reindeer soup called Bidos is the national dish on special days. The clean, wild, and raw food ingredients of the Arctic make the cuisine unique. Unite this with the special preservative opportunities of the Arctic, and you are stuffed with a variety of food making ways. Traditional recipes of the Arctic are tasty treasures.